CHICAGO (AP) — The Tampa Bay Rays made it clear they were going to give Austin Meadows every opportunity to develop into the major contributor they envision him becoming. Performances like Tuesday’s are the payoff. 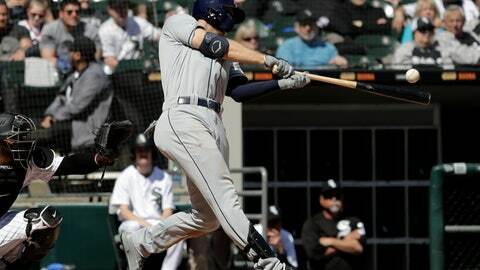 Meadows homered and set a career high with four hits, Avisaíl Garcia connected against his former team and the Rays beat the Chicago White Sox 10-5. Meadows drove in a personal-best four runs and helped break open a game that lasted 3 hours, 56 minutes. He singled and scored in the first, hit a two-run drive in the second and added an RBI single during a two-run fourth in which Tampa Bay chased Santana. He also walked with the bases loaded in the ninth. The Rays acquired Meadows from Pittsburgh last July as part of a trade that sent Chris Archer to the Pirates for a wealth of young talent. The Rays also got hard-throwing right-hander Tyler Glasnow and highly touted pitching prospect Shane Baz. Meadows debuted last season and played in 59 games for the Pirates and Tampa Bay. He said he got a confidence boost in the offseason when Cash told him in a phone call to show up ready to contribute. “I feel like I belong here,” Meadows said. Yoan Moncada knocked a two-run homer in the third for Chicago. Tim Anderson had two hits, including an RBI single in a three-run eighth. But with the White Sox trailing by three, pinch-hitter Adam Engel struck out swinging at a 3-2 pitch with the bases loaded to end that rally. Tampa Bay’s Tommy Pham extended his club-record on-base streak to 44 games with a single and two walks. Rays: 2B Joey Wendle (strained left hamstring) ran on a treadmill for the second straight day, Cash said. Cash also said 3B Matt Duffy (back/left hamstring) has been ramping up his rehab. White Sox: Manager Rick Renteria had no timetable on when OF Jon Jay will return and said it’s a “safe bet” Jay will go on a rehab assignment before he is activated. Jay has been sidelined since last month because of a strained right hip that has caused pain in the groin area. Rays: Glasnow (2-0, 0.82 ERA) looks to continue his dominant start. He tossed three-hit ball over six scoreless innings at San Francisco last week after holding Houston to one run over five innings.